As you sit on the beach or lounge by a pool this July and August, here are 8 books about booze that should be on your summer reading list. What goes better than music and booze? This book combines rock ‘n’ roll and mixology into The Rocktail: “A rock-based cocktail, guzzled while listening to classic rock.” Side A gives you a quick overview of the basics—glassware, equipment, techniques and spirits—and a selection of Old Time Rock ’n’ Roll classics such as Jumpin’ Jack Splash and Jailhouse on the Rocks. Side B moves on to the modern age, with cocktails such as Rum As You Are, Eggnoggin’ on Heaven’s Door and Should I Stay or Mojito. Pretty Fly for a Mai Tai offers 75 cocktail recipes accompanied by illustrations; there is even a discography at the back. Brought together in one guide are the author’s take on the top 101 cocktails to try while you’re still alive. These range from the classics such as the Old Fashioned, Manhattan and Vesper, to the less-well-known Scofflaw, Irish Mermaid and Bramble. 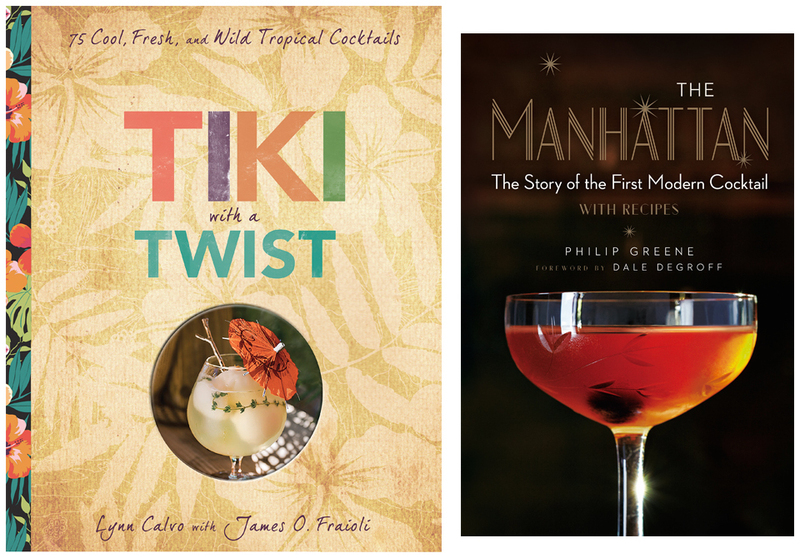 This book takes readers on a tour through history’s most famous and infamous cocktails. Each entry comes with a detailed background, anecdotes and a list of ingredients—as well as retellings of cocktail myths and legends. Author Francois Monti is a Madrid-based journalist specializing in drinks and cocktails. He is the author of a number of books, including Prohibitions, and writes the blog Bottoms Up. This book is a celebration of time-honored cocktails, the evolution of their formulas, and the inspiration they provide for today’s craft bartenders. The recipe collection serves as a re-introduction to 10 iconic potions: from the Manhattan to the Whiskey Sour to the Bloody Mary and more. It explores the drink’s progression and development in cocktail culture. Each section introduces a standard cocktail, offers details and insights about its genealogy, then follows with more than a dozen adaptations and variations. Recipes include reimagined classics such as the Earl Grey Old Fashioned, Jamaican Coffee and Drifter’s Daiquiri. This is the memoir of Napa Valley icon Miljenko “Mike” Grgich, president/winemaker of Rutherford, CA-based Grgich Hills Estate. It’s the story of a young Croatian boy whose search for freedom and the chance to fulfill his American Dream led him through countless hardships to become one of the most revered winemakers in history. This year not only marks Mike Grgich’s 93rd birthday, it’s also the 40th anniversary of the famous Judgment of Paris. That’s when a 1973 chardonnay crafted by Grgich for Chateau Montelena became the first California chardonnay to win a French winemaking contest, putting the state’s wines on the global map. Everybody loves a good Tiki drink, especially during summer. This book from Lynn Calvo—owner of Lynn’s Hula Hut in Montauk, NY—offers a refreshing take on tipples that bring a taste of the tropics and capture the spirit of modern Tiki culture. Recipes include the Coconut Cucumber Mojito and the Honeydew Daiquiri, as well as the Nutty Samoan and the Tahiti Spice Tikitini. The book also offers details on Tiki culture; bar tools and techniques; how to make your own infusions, purees and syrups; and decor tips to create the ideal Tiki setting. When the Manhattan came along in the late 19th century, it changed everything, according to this book. As Gotham’s watering holes embraced the new concoction, the original cocktail soon became old hat and known as the Old Fashioned. Cocktail historian Philip Greene traces the evolution of the drink from its competing origin stories through its continuing influence and extensive progeny, including the Martini. Illustrated with vintage ads and artwork and luxe photographs, this story of the Manhattan also offers 65 easy-to-follow recipes. Classic variations and contemporary updates range from the Brooklyn and the Vesper to the Little Italy and Red Hook. 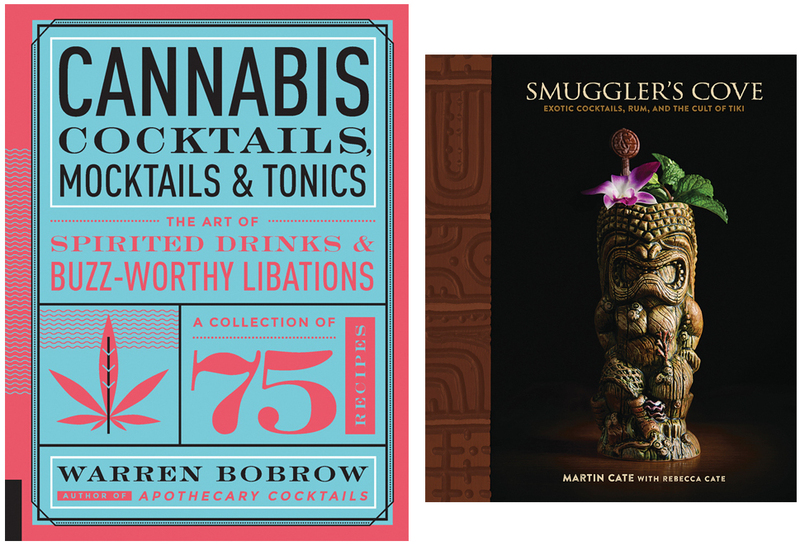 Combining cannabis and cocktails is a recent trend, and Cannabis Cocktails, Mocktails, & Tonics features a collection of 75 recipes of cannabis-influenced cocktails and drinks. Author Warren Bobrow describes how to de-carb cannabis to release its full psychoactive effect. 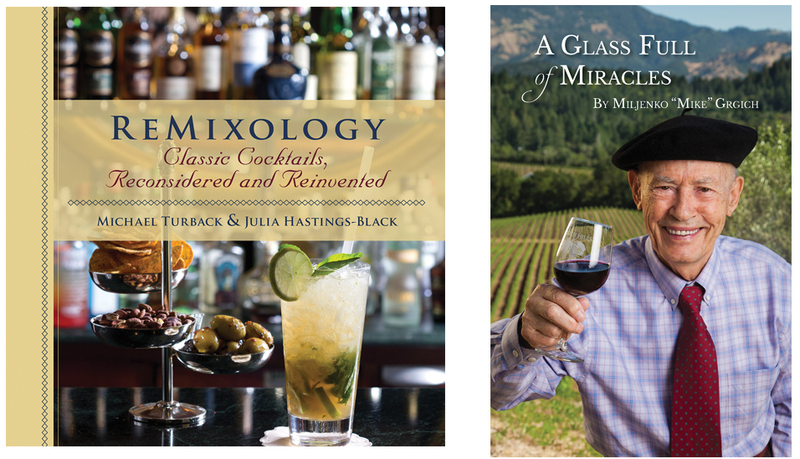 He encourages readers to look beyond cocktails and create successful tonics, syrups, shrubs, bitters, compound butter and infused oil to use in any drink. What do these cannabis-based concoctions do? Coffee, tea, and milk-based cannabis beverages can promote healing and relaxation, for instance, while mood-enhancing shrubs and syrups can provide an afternoon pick-me-up. Make yourself a Mai Tai, put your favorite exotica record on the hi-fi, and prepare to enter the world of Tiki, an often-misunderstood movement in American cultural history. Martin and Rebecca Cate, founders and owners of the San Francisco Tiki bar Smuggler’s Cove, take readers on a journey into the lore and legend of Tiki: its birth as an escapist fantasy for Depression-era Americans; how exotic cocktails were invented, stolen and re-invented; Hollywood starlets and scandals; and Tiki’s modern-day revival. The book features more than 100 recipes, plus tips on stocking a bar with great rums, decor and inspiration for your next Tiki event.